Yesterday was our one-year anniversary of buying Aquabat and oh what a year it's been! Actually buying a boat made this far-off, someday dream a reality. I guess I was waiting to start the blog until it became official as today happens to be our one-year blogoversary! In May 2012, two weeks after our wedding and four days after I finished my last nursing shift, we heading off into the world with a one-way ticket to the US. We had been spending all of our spare time looking at boats all around the world but still hadn't found any boats that ticked all the boxes and still feel within our price range. Because of how the Aussie dollar was doing, we decided we would get the best bang for our bucks buying the boat in either the US, Caribbean or Europe. We had planned to spend a year in the US: travelling around, spending time with family and friends, making me a US citizen, finding a boat and getting ready for this big adventure. With Bryce having never been the US before, we managed to fit in 33 states and had so much fun doing it. We had our eyes set on a boat in the Caribbean and I will admit that the marble counter tops played a minor role in influencing my desire. There were, of course, the "dream boats" but they were sadly just never within our budget. 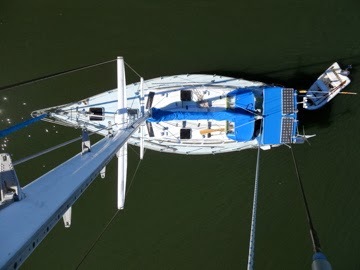 The basics we were looking for were an aluminium hull that was strongly built for offshore cruising, a freestanding rig, shoal draft, a long waterline and about 40ft in length. Buying a boat is about compromise and we knew we would never get all of it. Just before Christmas, Bryce headed back to Australia to reset his visa and visit a newly-born nephew. 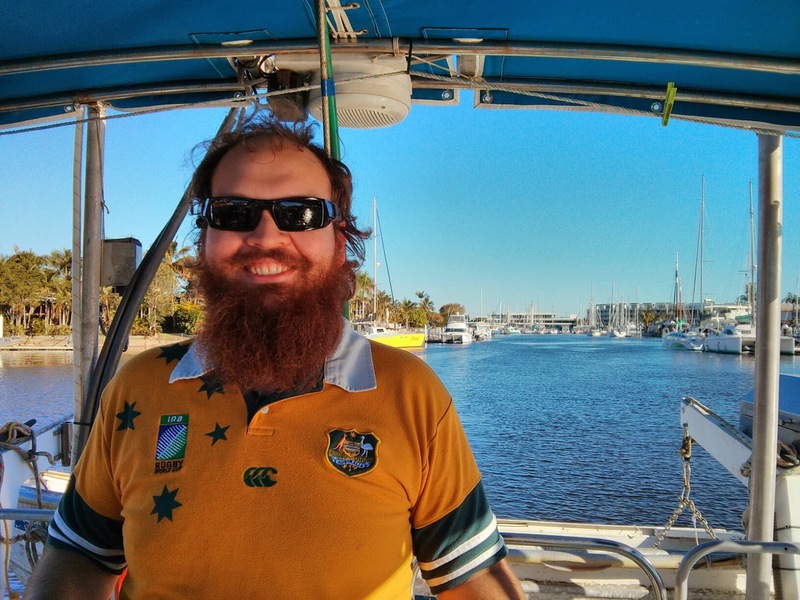 While he was there, he continued searching for boats and came across Aquabat, moored in Mooloolaba. She ticked a lot of the boxes, including the price. 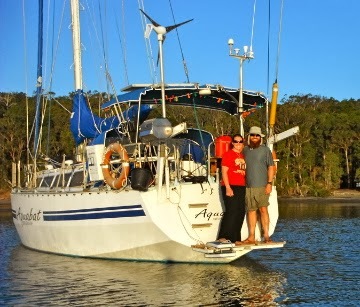 He quickly drove up from Brisbane to check her out, arranged a test sail and before long we were organising surveys and preparing to buy our very own boat. 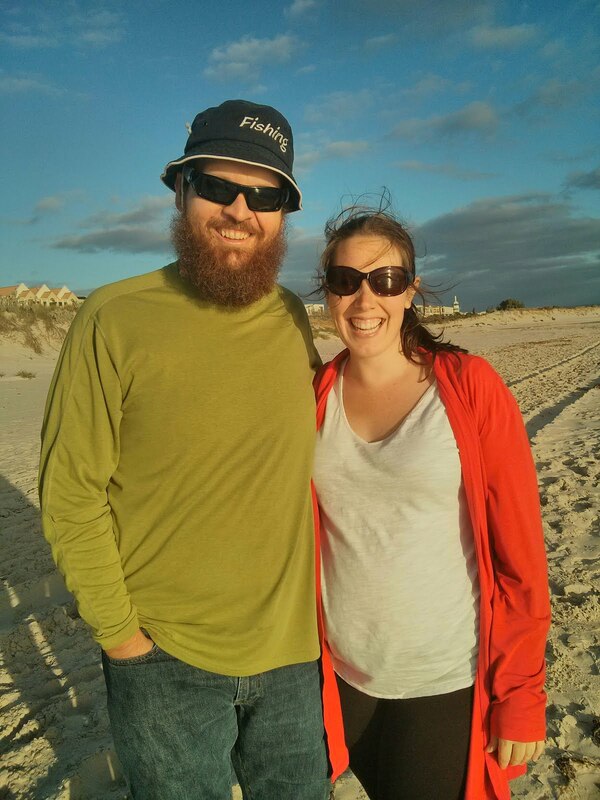 Bryce was in Australia for 5 weeks total and found Batty (as we like to call Aquabat) a week before he left! We had searched all around the world for the right boat and she ended up being right in our backyard! Go figure! Before we signed on the dotted line, I had never even set foot on board. I was totally trusting Bryce and the feeling he had. He took very detailed photos and videos for me and I watched them over and over again trying to imagine it as my new home. We were both also completely reliant on the surveyors who were our eyes on the ground as we, at the time, knew only what we had read and were not present for the surveys. Just before we signed, Cyclone Oswald hit Australia and the area flooded and had quite severe storms. Aquabat survived unscathed and we went ahead with the purchase! 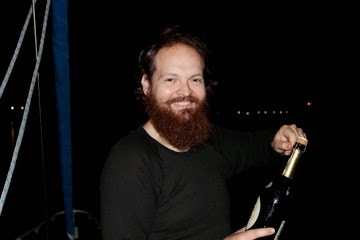 Celebrating boat ownership - we wouldn't dream of wasting good champagne! With a starting place and a vessel to take us away, we set about planning our return to Australia. We were WAY overambitious/optimistic/unrealistic (take your pick). We planned to take a month to get the boat ready to go and then take off. In that month, we learned so much, including that it would take us a lot longer then a month to be ready to go. There were other set backs too, of course and we are still here. With such a large learning curve, we have both learned so much in this past year. We have had wonderful highs and crappy, miserable lows. As they say in the cruising world, the highs are higher but the lows are lower. 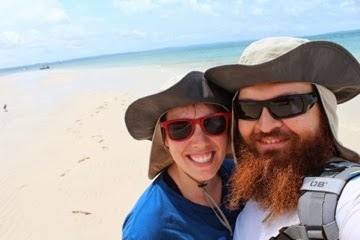 We did manage to get away for a couple of months to cruise the Great Sandy Straights before Bryce was called away for work. This was an awesome taste of what we have to look forward too. We know that there will always be things to get done, the unrelenting, endless to-do list is always there. At some point soon, we will cast off the lines and when we do we will be so ready! Until then, we just have to be patient. Lovely story. I hope to join you both onboard soon. Good story! You have both dpne very well! Best wishes.